Jean-Paul Goude is a creative tour de force whose prodigious output transcends multiple creative disciplines. From advertising and art to film and fashion, the aesthetic he established with Grace Jones remains as divergent today as it did at the dawn of the 80s. Written by Andrew Dineley. Jean-Paul Goude met Grace Jones in New York in the late-70s while he was working as art director for Esquire magazine and the diva-in-waiting was forging a mainstream disco career. An ascending star was in the making but the Grace Jones we think of today was yet to be reborn and released into the wider musical and artistic arena. Initially, Jones’ image very much reflected her physical and musical surroundings. As an established part of the Studio 54/Warhol pop art glitterati, her image naturally complemented what was going on around her. Her first three album covers were art directed by Richard Bernstein – the man behind the cover designs of Andy Warhol’s Interview magazine. Jones, like every other glamorous subject that graced the cover of Interview, had previously been presented in airbrushed, hyper-saturated hues and treated to the perfect disco demeanour. This celebrity cookie cutter formula had run its course for her though. Criticism of their collaboration that may portray Jones as a victim of artistic exploitation, an unwitting casualty to Goude’s desires, may overlook the fact that the star herself had been in control of her artistic destiny almost from the start, and from her recent memoirs it is apparent that she was never a slave to the vision of Goude. Jones saw herself not as a model, but a “partner in design”, transforming the story of her life into “a series of visions and fantasies”. 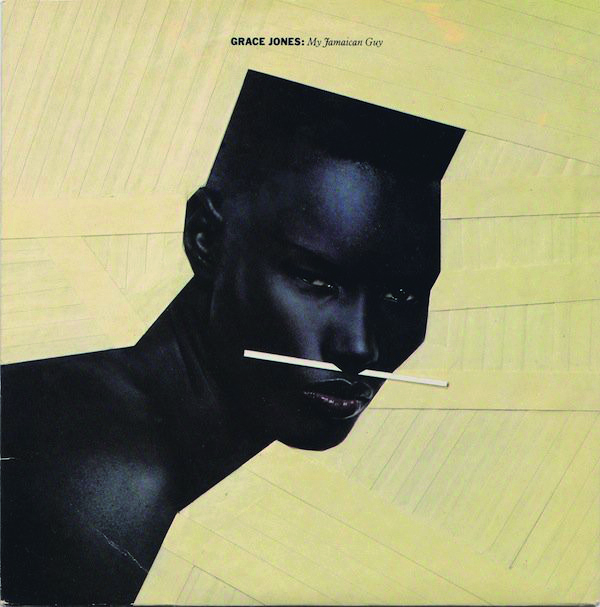 This defiant new design of Grace Jones as an androgynous artwork was an important part of her reinvention. An image that was perfect for the time and one that would endure for a run of four albums, all designed with Goude and all released with Island Records. The icon was born and the fanbase was swelling, along with commercial success and arguably also her infamy. 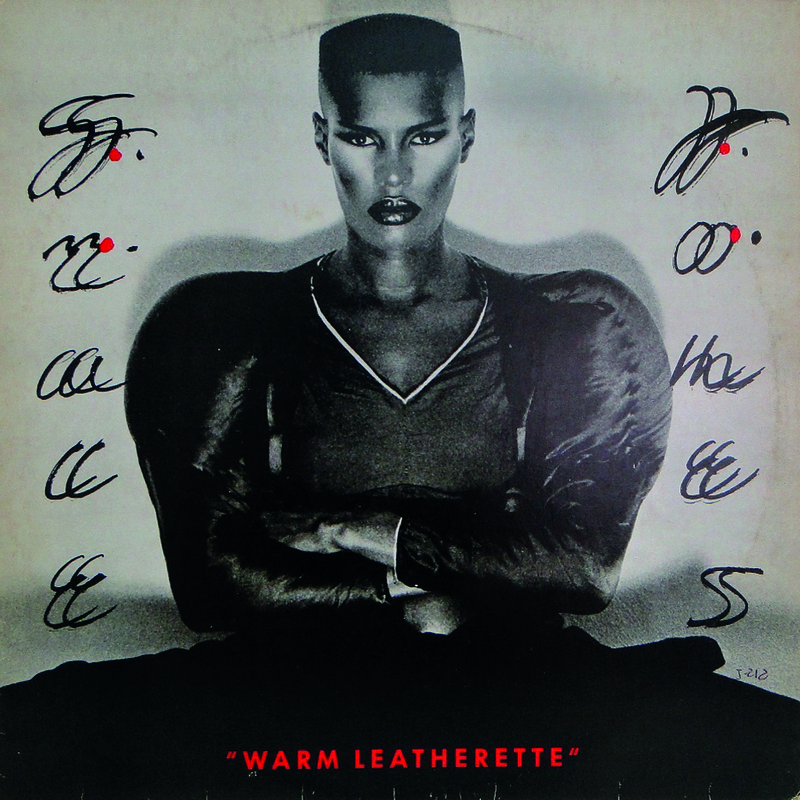 In 1980, Grace Jones released her acclaimed album Warm Leatherette. Goude’s monochromatic sleeve image was in massive contrast to everything that had gone before for her and fitted in comfortably with a period that saw gender bending normalised. 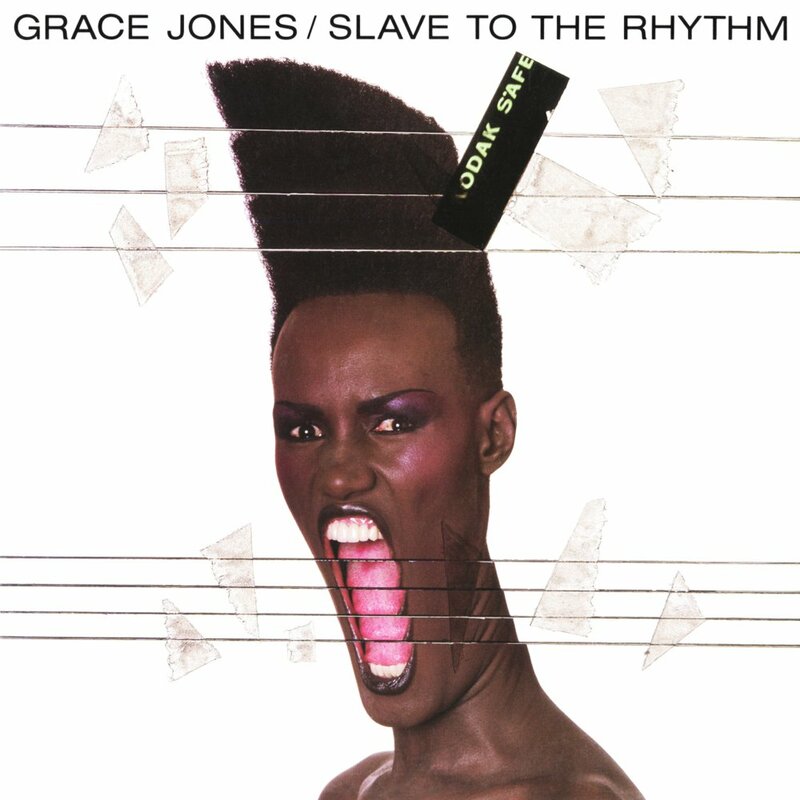 Goude’s perfectly symmetrical sleeve image of Grace was a stylistic precursor for what was to be found in some of the sounds within – angry and angular, oozing a forthright confidence that would set a strident tone for the albums to come. 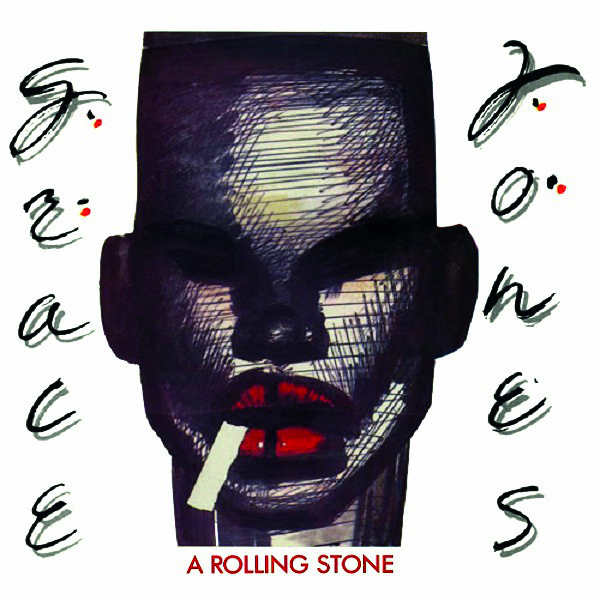 A Rolling Stone was released as a single from this album and for the sleeve image; Goude opted to use one of the copious portraits he created of Jones during this period. The hand lettering used for the single naturally matched that of the album, but the portrait exaggerated her features, potently shifting her colour and form. The single sleeve may also have been a study for the album that would follow, also showing the artist with a long cigarette hanging from the right side of her mouth. 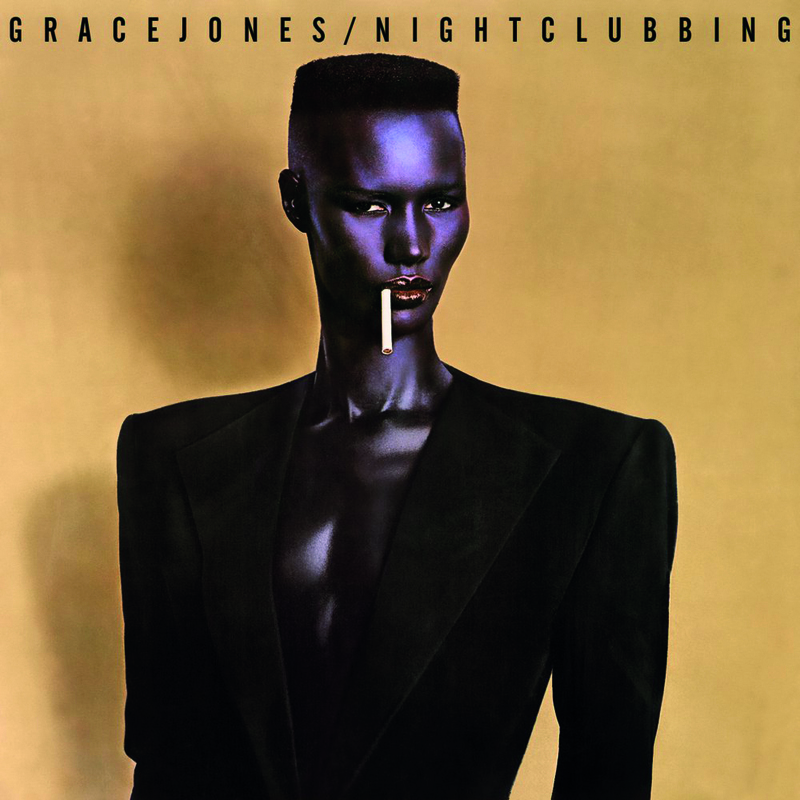 The Nightclubbing album in 1981 saw Jones’ image elevated further into the artistic realm. Was it pop or was it art? Was it human or machine, man or woman? This image of Jones as the austere alien was another perfect marriage of sound and vision. It also further consolidated her artistic ambitions on an album that would contain career-defining singles including Pull Up To The Bumper and Walking In The Rain. 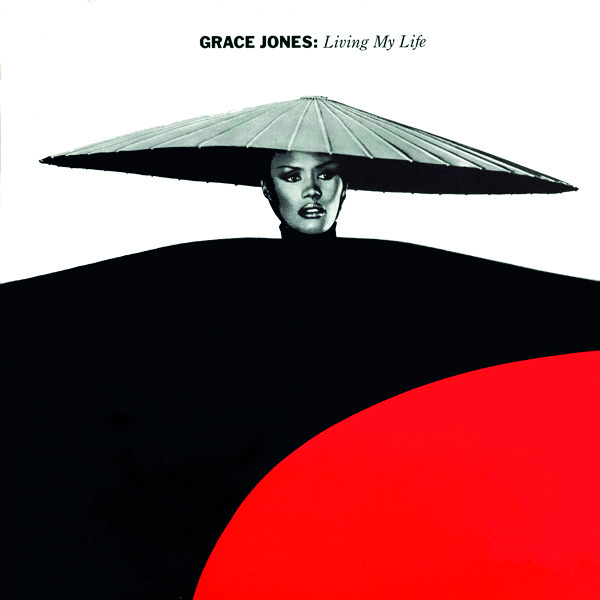 The cover photograph has to have taken inspiration from Vladimir Tretchikoff’s famous Chinese Girl painting from 1952, where the glowing subject, exactly like Jones here, is shown turned slightly to the left with glowing blue skin, bright red lips and dark hair against a murky anodyne background. If the resemblance is a coincidence, it is an amazing likeness albeit with their respective images of femininity being diametrically in opposition. 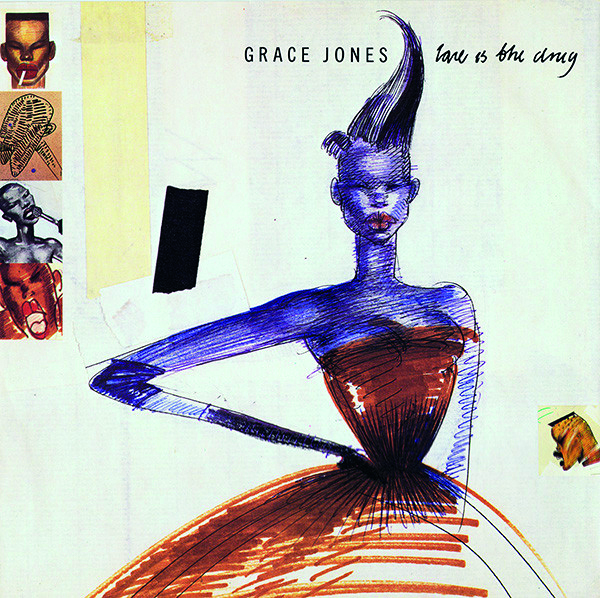 In 1982, Goude directed a groundbreaking, long-form video for Jones entitled A One Man Show in which she performed many of her biggest hits amid a variety of minimally modernist sets. They worked together on a photograph that showed Jones in a cage with raw meat, labelled “Do not feed the animal”. These provocative images were collaboratively devised to shock. By this time, disco was officially considered dead in the US and in the UK punk had ripped up the rulebook a few years earlier. 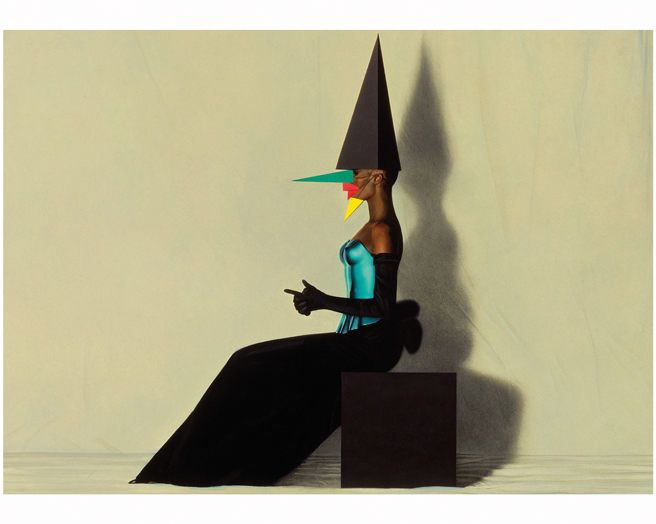 Goude’s striking case image for the A One Man Show film depicted Jones’ stern profile, with a lifelike mask and various cubist facial adornments being pulled away to reveal the character behind. A more detailed, wider shot variant of this scenario was also used a year earlier in a photograph entitled Libertango. A similar cutting and taping technique was also used, and is more evident on the cover of the single for My Jamaican Guy from the same album. 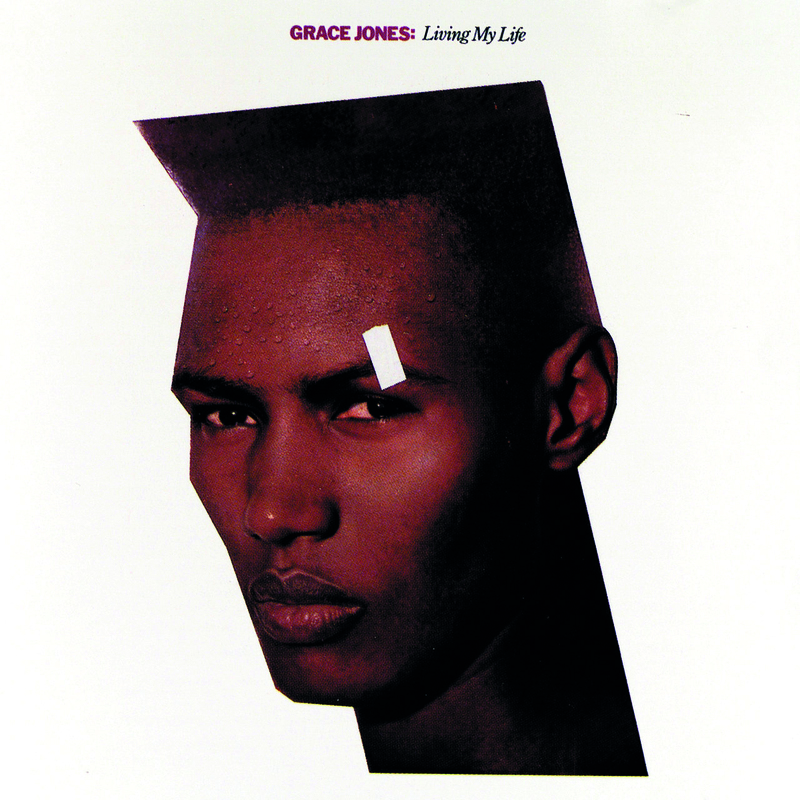 In 1983, the sleeve image that Goude shot for the cover of the single, Living My Life featured the singer as art once again. The look had been used in video – all sharp angles, slabs of fl at primary colour and eccentric costumery that by this point was an established trademark. There is an exoticism and detached cool about so many of the images from this period. Every image was a strategic, bold statement. 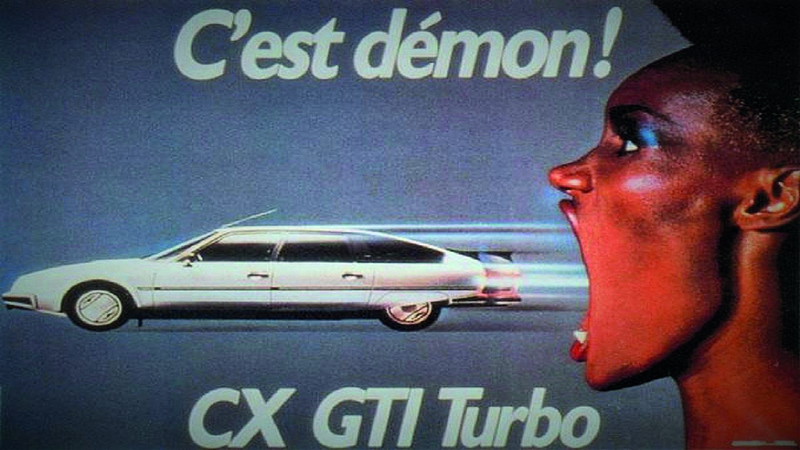 This transformation also extended further into Goude’s advertising work as he famously used Jones image in press advertising and TV commercials for Citroën. Coming full-circle, some of these advertising images were then re-appropriated and reused in the remarkable video for the hit single. Building on the commercial success of Slave To The Rhythm, some of Jones’ back catalogue was re-released that same year and Love Is The Drug, a single from five years earlier appeared once again, this time with Jean-Paul Goude imagery on its sleeve. A change in record company saw four years pass before Jones and Goude would work together again but visually they picked up roughly where they had left off. For the album sleeve of Bulletproof Heart in 1989, they used an image of Jones stylistically reminiscent to some of the photography used in the Citroën advertising. 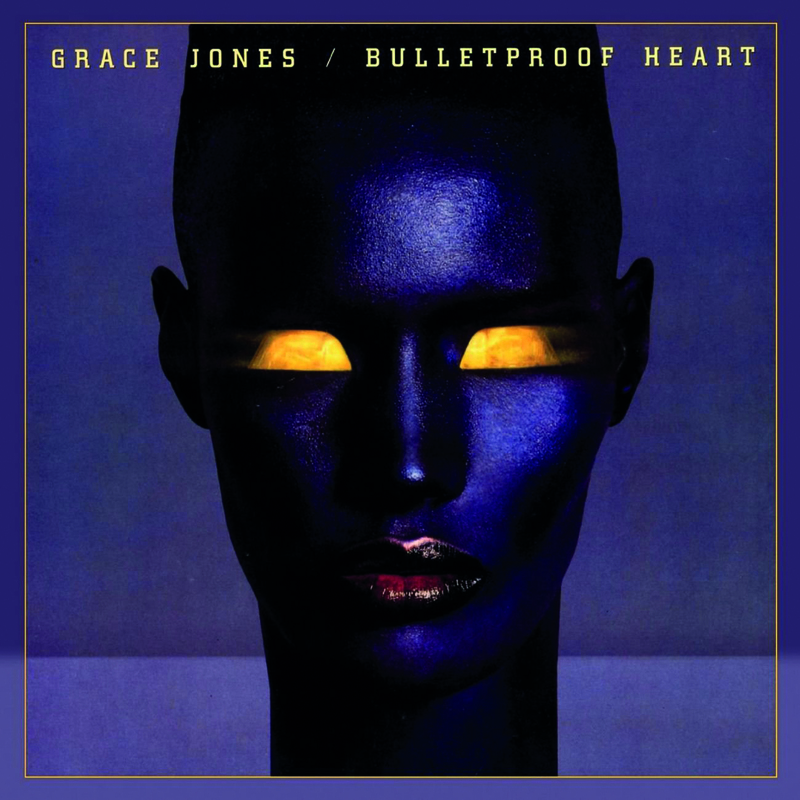 The Grace Jones with the bulletproof heart was now half woman, half machine, all cybernetic chic. 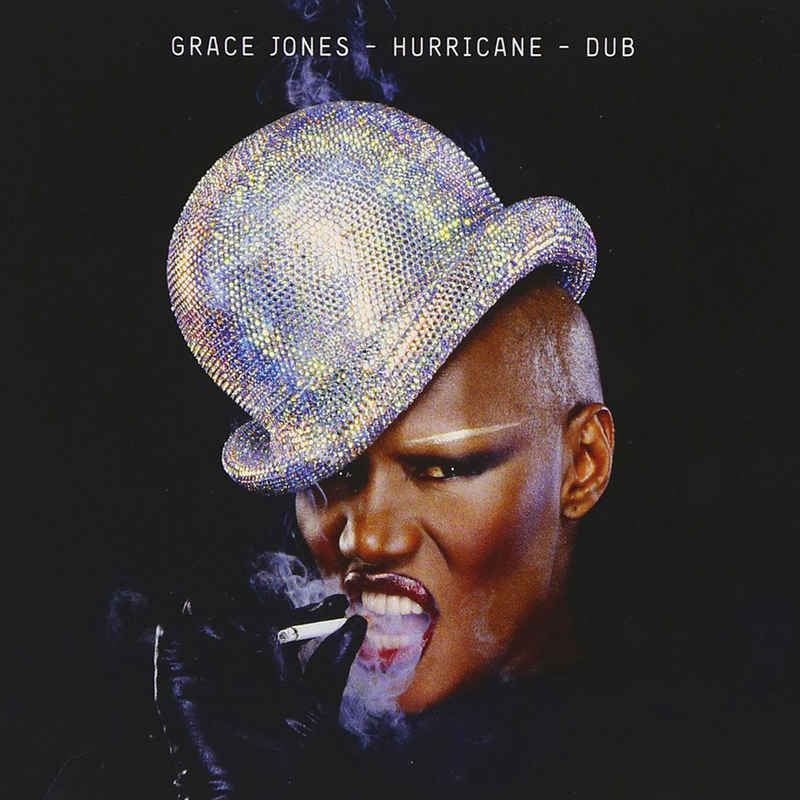 Returning back to humanity, for 2011’s Hurricane – Dub we see Grace Jones depicted as a strong woman once again. Goude’s powerful photograph shows the star defiantly glaring out from the cover, with all detached robotic artifice replaced with fierce showbiz glamour. This is Grace Jones as show woman, resplendent in a bejewelled hat. This is an image of Grace that is looking forward with only a cigarette perhaps visually hinting to any identifiable past. Some quotes in this feature are taken from I’ll Never Write My Memoirs by Grace Jones and Paul Morley. Published by Simon & Schuster, 2016. Issue 42 of Classic Pop is on sale now!